Cliff is the model of a homegrown made-in-Solano County success story. Cliff was born and raised in Benicia, California, which he still calls home today. EMS caught Cliff’s interest early. He went to EMT school at Solano College, then applied to work at Medic Ambulance, where he quickly became part of the family. Cliff put his time and effort into becoming the best EMT he could be, and when it was time he knew he was ready to take on the challenge of becoming a Paramedic. Cliff not only has passed that challenge but also led the way for others. 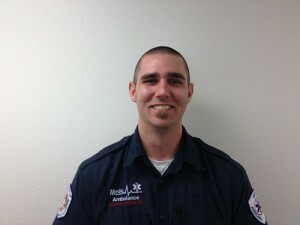 Cliff is now finishing his eighth year as a Paramedic at Medic. He is a Field Training Officer, County Preceptor, and the Chair of Medic Ambulance’s Internal Quality Improvement Committee. Cliff is being recognized as a Star of Life for his role as one of Medic Ambulance’s Community Paramedics. Community Paramedicine is a new and innovative model in providing healthcare, and Cliff is one of only 77 Community Paramedics in the state. Cliff dedicated many hours to mandatory didactic and clinical training as part of the program, all while still performing his normal job duties as Paramedic. Cliff always takes the time to instruct, improve and create a better environment for others. Whether it is a Paramedic student or a new employee, Cliff is always there to lend a helping hand. Cliff’s commitment to excellence shows in everything he does, and thus he has been selected for the third year in a row as Medic Ambulance’s 2016 Paramedic of the Year. Cliff was also recognized as a 2016 California Star of Life for his performance excellence in March by the California Ambulance Association in Sacramento, California. In Cliff’s free time he loves spending time outdoors and with his son, CJ. Great job, Cliff!